Fashion month is upon us again and to be honest, I can't wait for the London portion (Burberry anyone?!) 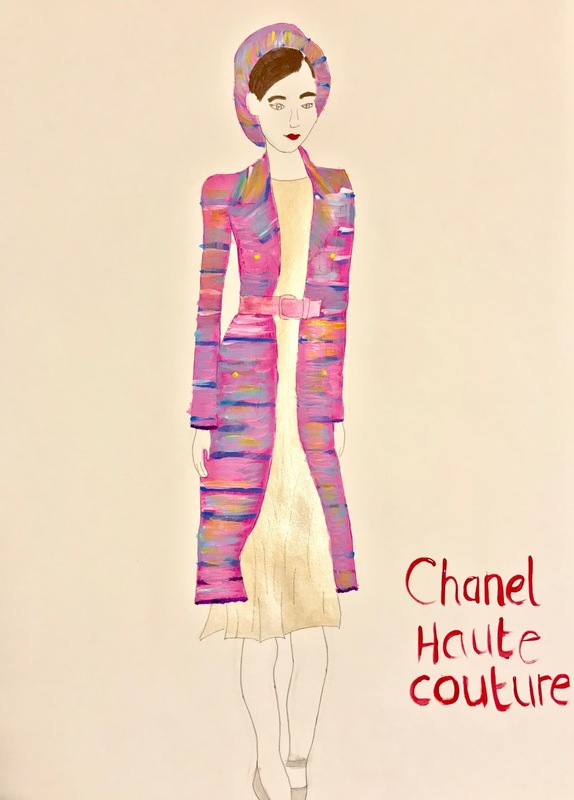 but until then, I've been trying to get caught up with what I missed of the Haute Couture shows a few weeks ago, namely Chanel. Of course everyone was talking about the amazing finalé look modelled by Lily-Rose Depp. But what I love most about Chanel Haute Couture is the immense tailoring and the finer details that you simply wouldn't get from a normal runway collection. I've handpicked my favourite looks (and I've even illustrated one of them) from the show and will discuss them in more detail-but if you get a spare moment, you can watch the full film of the collection here SPOILER ALERT-it's a beauty!! From the off, Look 1 was simple yet striking. The detail here is in the tailoring of the bouclé, and I loved the pussybow collar, very Karl, very Parisienne! J'adore! ...thoughts? Expect more illustrations on my blog over the coming weeks! Look 40 is exceptional elegance at its best. I absolutely love the finer detail on the jacket and on the trim of the dress; a perfect look for a summer ball or wedding (if only I could afford the hefty pricetag!). Again, it was the elegant embellishments that caught my eye with Look 52 but I also love the shape; perfectly flattering for a small waist. Absolutely stunning! The final few looks of the show were showstoppers, perfect cocktail party dresses with inspiration from a variety of eras and Look 65 was my favourite of them all! I love the fluidity of it and the flowing feathers after the slim slip-dress style structure. Perfect for any red carpet-amazing! Which looks were your favourites?